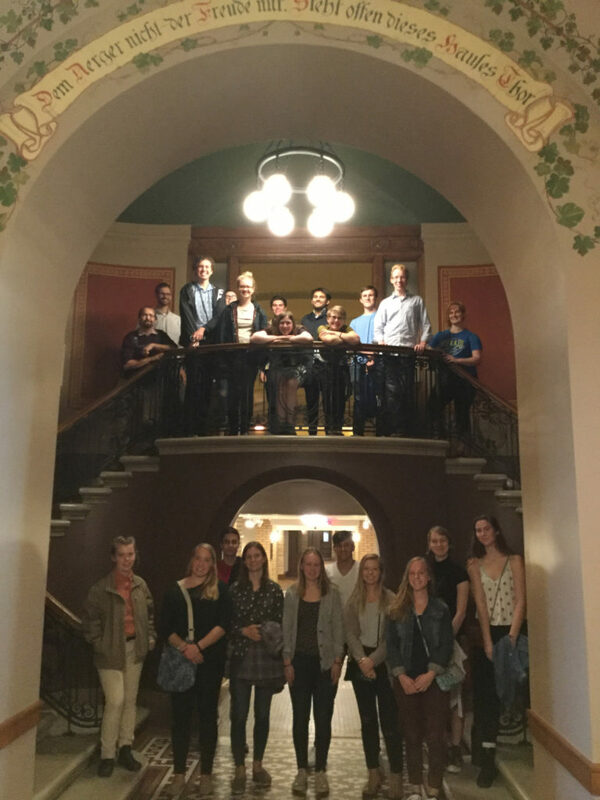 This report summarizes the joint outing of the German programs at Carleton College and St. Olaf College to sites and events of interest for German Studies in the Twin Cities, including a visit to the renovated Rathskeller of the Minnesota State House, a tour of sites related to German immigration history in St. Paul, and a dinner and lecture by Gerhard Weiss at the Germanic-American Institute (GAI) in St. Paul. The event went according to plan and was reviewed positively by students and faculty from both St. Olaf College and Carleton College, as well as by our collaborators at the GAI. On Friday, September 29, a mini-bus picked up students at St. Olaf at 3:15pm, then proceeded to Carleton to pick up the remaining participants there at 3:15pm. Despite heavy traffic on the interstate to St. Paul, we arrived at the state capitol with 20 minutes before the building closed, so we were able to walk into the Rathskeller in the basement of the building and have ample time to view the architecture, including historic frescoes in German, and to read informational signs about the history of the building. We departed the capitol at 5pm and picked up our tour guide, Dave Bredemus, at the Germanic-American Institute at 5:15. Mr. Bredemus then guided the bus driver around the Summit Avenue and Irving Park neighborhoods of St. Paul while providing numerous anecdotes and background information about the German heritage in this portion of the city. Finally, at 6:30pm we returned to the Germanic-American institute for an excellent “Abendbrot” dinner of bread from Aki’s Bread Haus (a German bakery in Minneapolis) and various meats, cheeses, and salads, which the participants raved about, followed by a reading and discussion of poems by Erich Kästner delivered by UMN professor emeritus Gerhard Weiss. The event with Professor Weiss was a highlight in a very different way than the rest of the evening: The large room at the GAI was full of rapt listeners, many of whom had known Weiss over many decades as his students and colleagues. The readings drew their energy from Weiss’s intimate love of Kästner’s texts, dating back to his childhood, when receiving a gift of a new Kästner volume was a much-anticipated event. Weiss’s long personal connection to Kästner’s texts was combined with full awareness of their difficult historical contexts (Professor Weiss himself emigrated from Germany, and the question of Kästner’s potential loss of credibility after remaining in Nazi Germany was discussed at some length). As a whole, students seemed to very much enjoy the event and be impressed with the diverse forms of German culture they encountered. 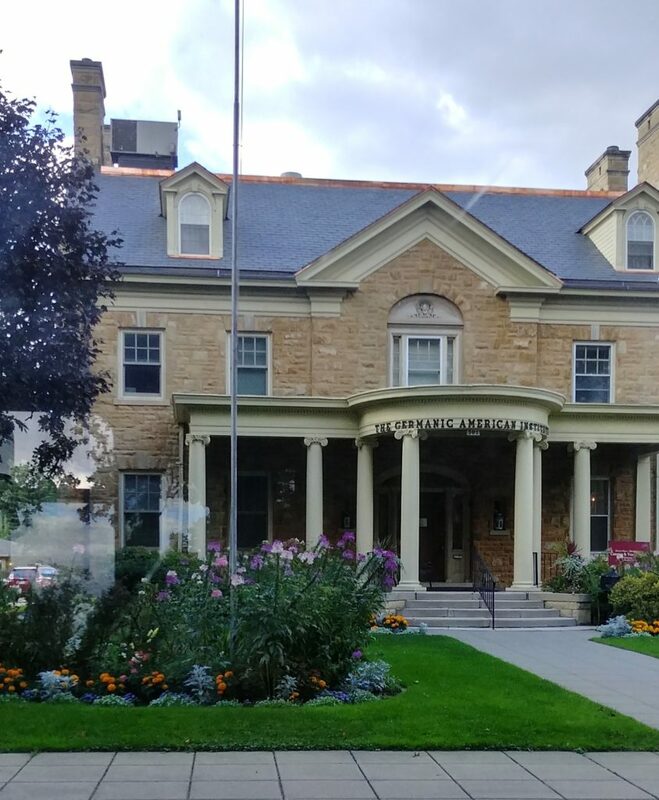 One particular student, an international student from Germany who is a freshman at St. Olaf, remarked that he was astounded to see so much German culture here in Minnesota. He commented that the tour of St. Paul, in which German culture was frequently described as a positive force in the city, and one that has been hidden (or even oppressed) because of anti-German sentiment dating back 100 years, struck him as very problematic. This response was based on his own understanding of German identity and culture, which is now very multicultural and productively infused with numerous international influences. But precisely this aspect made the trip valuable: The student commented that the tour, the following lecture at the GAI, and the in-depth conversations with fellow students and professors that took place on the bus ride home, provided exactly the sort of critical intellectual experience that he had hoped to get out of studying at a liberal arts college in the US. The goal of the trip was to make productive use of the resources at St. Olaf, Carleton, and the GAI, and based on all of the responses I have heard, as well as the lively conversations between members of all three institutions throughout the evening, I feel that it was fully successful in meeting this goal.